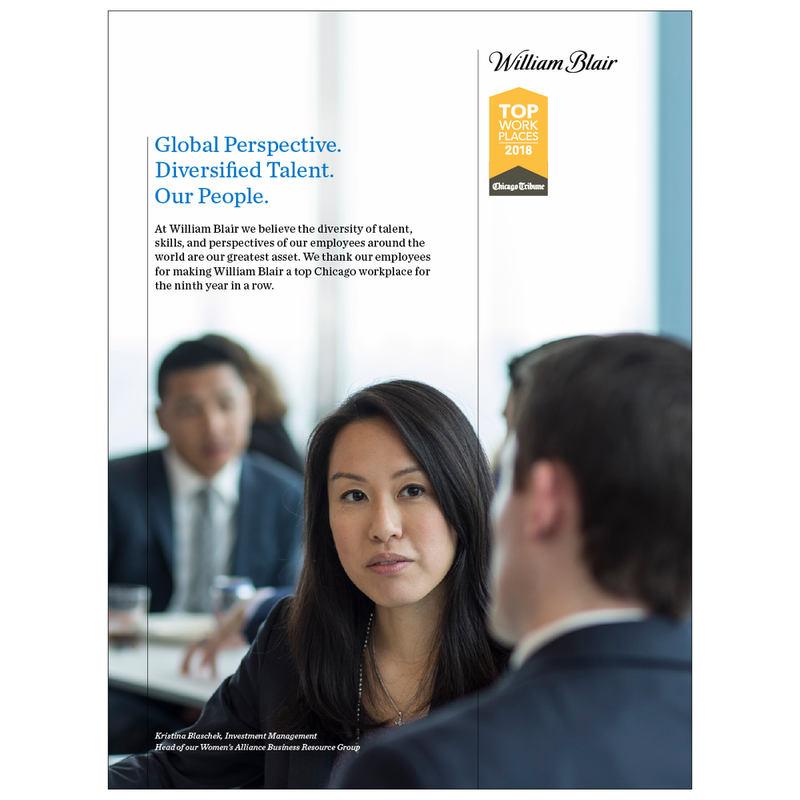 William Blair is a premier global financial services firm focusing on investment banking, investment management, and private wealth management. As part of William Blair’s small in-house creative team, I promote consistent quality standards of the corporate brand identity system for both digital and print. This role includes digital wireframing, photo art direction, video storyboarding, social media assets, and more. I also coordinate and facilitate relationships with outside production agencies, vendors, and freelancers when necessary. I provide art direction, edit photography, and design layouts for William Blair’s advertising. It’s a collaboration with our photographers, copywriters, and other stakeholders. 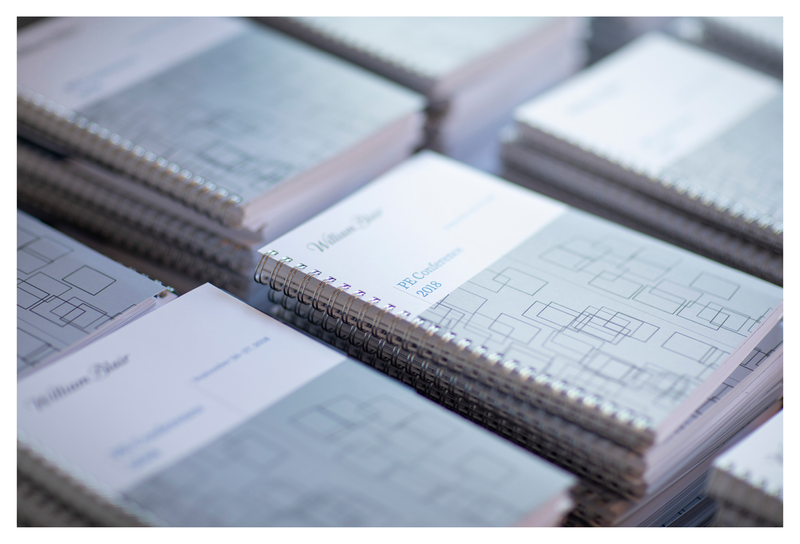 In 2018, we re-examined the brand identity for William Blair’s long-running private equity conference—where an exclusive group of investors meet select private companies. For several years, the conference was branded with this insignificant (and ugly) abstract green motion image. A major part of the refresh was shifting the event to a more stylish, contemporary, and welcoming venue: the Loews Chicago Hotel. The interior design is black and white, gray, and punctuated with burgundy. This is our winning redesign. The overlapping shapes imply "connections" and it complements the grids and patterns of the venue’s interior design. At the conference, we applied the branding to different touchpoints to create a comprehensive, professional look-and-feel for our guests. In late 2017, the Brand Marketing and Communications department completed a video to spotlight 2017’s achievements and capture the “unheard voices and faces” of William Blair. I provided guidelines and resources of William Blair’s visual system for the video editor: including correct logo usage, typography, colors, and stock footage. I managed all of the in-house assets and related files and oversaw the transcript editing process. During filming, I interviewed several of our employees for different segments. I provided interviewees with prompts on his or her talking points and provided feedback to the videographer between takes. I guided the interviewees to help us get the specific words and phrasings we needed. I was also on-hand during the b-roll filming in the office. The video premiered at the 2018 Town Hall Meeting and Outlook for all 1,300+ employees across the globe. It was later distributed online, as well as on large displays throughout the Chicago office building. My team advocates for a visual content strategy on our social media channels to attract attention and encourage more audience engagement. I design promotional merchandise and work with our vendors and partners on branded clothing, office supplies, specialty client gifts, and more.